We are pleased to announce an opportunity for our intermediate to advanced-level students to cross-train at the local Judo gym during the Summer Term 2019. Join us for our bi-monthly Koryu Uchinadi open training session held at the Swiss Cottage-based ‘The Winch’ on Sunday 5 May 2019 from 2pm - 4pm. Join us for an open mat session at our London Fields studio from 3pm - 4:30pm on Sunday 12 May 2019. Join us for our bi-monthly Koryu Uchinadi open training session held at the Swiss Cottage-based ‘The Winch’ on Sunday 19 May 2019 from 2pm - 4pm. Join us for an open mat session at our London Fields studio from 3pm - 4:30pm on Sunday 26 May 2019. Join us for our bi-monthly Koryu Uchinadi open training session held at the Swiss Cottage-based ‘The Winch’ on Sunday 2 June 2019 from 2pm - 4pm. Join us for an open mat session at our London Fields studio from 3pm - 4:30pm on Sunday 9 June 2019. Join us for an open mat session at our London Fields studio from 3pm - 4:30pm on Sunday 23 June 2019. Join us for an open mat session at our London Fields studio from 3pm - 4:30pm on Sunday 14 July 2019. The London Koryukan’s 1st Spring Camp 2019 held from 8 - 16 April 2019 in Fuzhou, China. The Children's Spring Grading 2019 will take place on Saturday 30 March from 3pm - 4:30pm at the London Fields studio. Join us for an open mat session at our London Fields studio from 3pm - 4:30pm on Sunday 24 March 2019. The 12th Ryukyukan Tournament will be held at the Jean Brown Indoor Arena in Essex on Sunday 10 March 2019. Join us for our bi-monthly Koryu Uchinadi open training session held at the Swiss Cottage-based ‘The Winch’ on Sunday 3 March 2019 from 2pm - 4pm. Join us for an open mat session at our London Fields studio from 3pm - 4:30pm on Sunday 24 February 2019. Join us for our bi-monthly Koryu Uchinadi open training session held at the Swiss Cottage-based ‘The Winch’ on Sunday 17 February 2019 from 2pm - 4pm. Join us for an open mat session at our London Fields studio from 3pm - 4:30pm on Sunday 10 February 2019. Join us for our bi-monthly Koryu Uchinadi open training session held at the Swiss Cottage-based ‘The Winch’ on Sunday 3 February 2019 from 2pm - 4pm. Join us for an open mat session at our London Fields studio from 3pm - 4:30pm on Sunday 27 January 2019. Join us for our bi-monthly Koryu Uchinadi open training session held at the Swiss Cottage-based ‘The Winch’ on Sunday 20 January 2019 from 2pm - 4pm. Join us for an open mat session at our London Fields studio from 3pm - 4:30pm on Sunday 13 January 2019. We are pleased to announce an opportunity for our intermediate to advanced-level students to cross-train at the nearby Bloodline Gym in Lower Clapton during the Spring Term 2019. Join us for 2 hours of KU fundamentals at the Old Winchester Arms (AKA The Winch) on Sunday 16 December from 2pm - 4pm. Join us for 2 hours of KU fundamentals at the Old Winchester Arms (AKA The Winch) on Sunday 18 November from 2pm - 4pm. The London Koryukan is pleased to announce a ground work class for our junior students with Dawid Farycki. Join us for 2 hours of KU fundamentals at the Old Winchester Arms (AKA The Winch) on Sunday 21 October from 2pm - 4pm. The London Koryukan is pleased to announce an exclusive opportunity to learn Hanshi Patrick McCarthy's bunkai practices under one of Hanshi's TOP instructors, Kyoshi Ante Brannbacka. Join us for 2 hours of KU fundamentals at the Old Winchester Arms (AKA The Winch) on Sunday 16 September from 2pm - 4pm. Tickets are £15 and can be purchased below. *No tickets will be sold after 25 June. Group/dojo discounts available on request. NO TICKETS WILL BE AVAILABLE ON THE DAY/ON THE DOOR! *Available until 25 June 2018 and/or until spaces run out. An amazing opportunity to train with one of the world's foremost authorities on Karate Do, Hanshi Patrick McCarthy (9th Dan): world-renowned author, historian and master-level instructor of Okinawan Karate. Please see the Transport for London (TfL) Jouney Planner for the most up-to-date information and advice on how to get here. The closest station to SportsDock is Gallions Reach DLR.The Docklands Campus is directly opposite Cyprus DLR station. Trains to Beckton via Cyprus and Canning Town usually run at five to ten minute intervals. Bus routes near the Docklands Campus include 101, 173, 262, 300, 366, 376, 474 and N551. A map of these bus routes is also available from TfL. Please see the TfL Cycle Journey Planner to help with planning your route. The SportsDock car park is provided for public users. London City Airport lies at less than 30 minutes by public transport away from the venue. There are many hotels in the area, just type in London E16 2RD at one of the hotel booking sites like booking.com to find a suitable place nearby. It is wise to book early as accommodation fills up early. Join us for 2 hours of KU fundamentals at the Old Winchester Arms (AKA The Winch) on Sunday 17 June from 2pm - 4pm. The London Koryukan is pleased to announce a ground work session for our junior students with coach Dawid Farycki. Join us for 2 hours of KU fundamentals at the Old Winchester Arms (AKA The Winch) on Sunday 20 May from 2pm - 4pm. Join us for 2 hours of KU fundamentals at the Old Winchester Arms (AKA The Winch) on Sunday 22 April from 2pm - 4pm. Join us for 2 hours of KU fundamentals at the Old Winchester Arms ('The Winch') on Sunday 18 March from 2pm - 4pm. The next class with Sensei Patrick Visnovsky following up from the sports Kumite class in January. Please join us for this exciting event. *No tickets will be available on the door on the day. 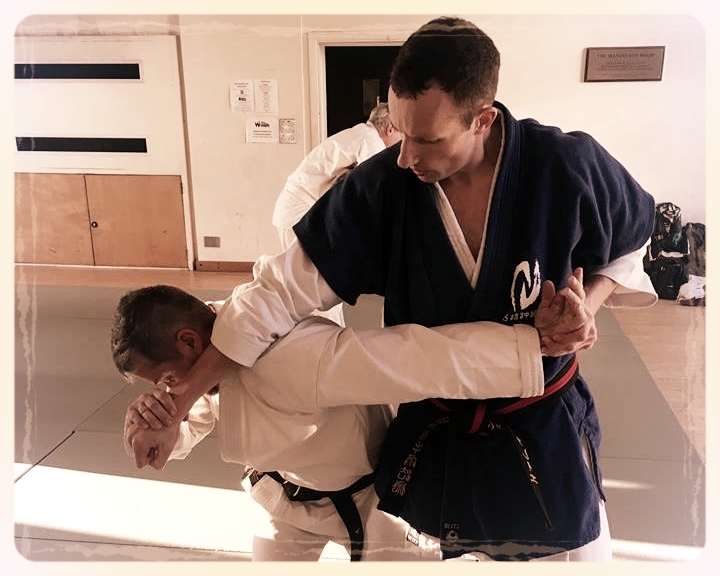 Sensei Patrick is the head instructor for the Hertfordshire Karate Academy, which runs as part of the English Goju Ryu Karate Federation (EGKF). Sensei Patrick functions as the national coach for the EGKF. This class will be held at our very own London Fields-based studio at Arch 379 Mentmore Terrace, Hackney E8 3PH. A basic understanding of sports karate is required. We look forward seeing you then!